Like it or not, average citizens like you and I have become part of “the media.” We text and tweet photos. We report the more interesting events of our lives to our friends and family as they happen. And, increasingly, we use video live streams to share what’s happening the very moment it happens. The prohibition stems from MLB’s licensing agreements. Ticket holders are not supposed to take video; credentialed media outlets are limited to 120 seconds of video or less. At least one team, the San Francisco Giants, told WSJ it was looking for ways to identify people who are live streaming games and monitor their content for copyright infringement. If the thought of the MLB police coming after you for shooting some low-quality video from the nosebleed seats sounds ridiculous, well … that’s because it is. Technology makes all sorts of cool new applications possible, but it’s quite unlikely that any live streamed fan-made video could every truly compete with a professional baseball telecast. Now that everyone in the stands is a potential live streamer, shutting down a live broadcast that’s doing no harm as it happens seems to be an unworkable idea. More importantly, courts have already addressed this issue and have ruled in the fans’ favor. In 1997, the National Basketball Association filed a suit against Motorola for having employees attend games and text out updates of the live action. The court ruled that while the game’s broadcast is protected by copyright, live action is. That’s because copyright laws exist to protect art (the edited broadcast), not live, unscripted events. You might get thrown out of a stadium in a worst case scenario, but you won’t get a visit from the MLB legal department. 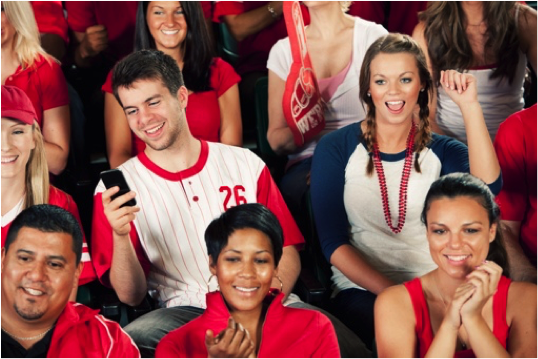 There’s a lot of money at stake when it comes to broadcasting rights, and that naturally makes sports organizations like the MLB, NBA and NFL hesitant to allow fan-created live content. Fans, emboldened by technology, will no doubt push back against this resistance. As MLB’s recent backtracking shows, us fans are likely going to wind up winning the battle. Live streaming, it seems, cannot be stopped.